Today I welcome Bianca Gulbalke to talk about her book, Born With Wings: The Immortal Life of Piu Piu. Bianca is an award-winning screenplay writer and artist, a passionate gardener, teacher and metaphysics student. What were your first glimmers of this story? Was it of the characters, the setting, or the plot itself? Thank you for your kind introduction, Ellis, I’m grateful and thrilled to be here! The glimmer came with a kind of magic: Piu Piu, the main character – pronounced ‘phew-phew’ – was real. The setting in the floral kingdom along the Western Cape coast of South Africa was – and is – real. The fire was real. Very real! The idea for the plot revealed itself when, shortly after Piu Piu was killed, causing much heart-break, a new Piu Piu appeared! Coincidence? I don’t think so . . . but definitely a story that needed to be told Piu Piu was quite an attraction in our garden. She was intelligent, funny and very protective of us, her adopted family. I was encouraged to write about her, but this only happened when disaster struck: I had a macular hole in my eye that needed major surgery. But the real ordeal came thereafter: I had to hold my head down for three weeks – no PC, no TV, no sport – the time for the wound to heal, which depended on my discipline in keeping the healing liquid right on top of the wound. That was tricky at night, as I naturally turned on my back. Eventually, I ended up sitting in the lotus position and meditate all through the night. Even with a long history in meditation and yoga, it seemed like a daunting task – but it turned out to be an amazing experience. It was during those long solitary hours in the dark, with owls hooting softly outside, that the magic happened and the story appeared. Typing blindly, with the keyboard on my lap and the laptop on the floor, the first glimmer took shape in form of a draft. With hindsight, those challenging three weeks were rewarding in many ways. Instead of being my usual pro-active self, I simply let go and ‘listened’ and observed . . . just as Pippa does at a crucial turning point in her life. How did being a filmmaker aid the process of writing this story? In a movie, you have to know within the first few minutes where the story is playing, who the main protagonist is, what has to be accomplished and what hurdles are in the way. In a novel, your first pages are important to draw your reader in, but you can take your time. As many readers may believe in reincarnation but are unfamiliar with say the latest afterlife research, I decided to start (and end) in the spiritual realm, giving the story a frame. I would probably also do this in the screenplay. It sets the tone and the reader immediately identifies with the heroine on her magical journey called ‘life’. Also, as a filmmaker or photographer you observe the world around you in a different way. You wear a storytelling lens. You’re always on the lookout to discover something worth sharing with the world. You tell a story by showing pictures . . . and a picture tells a thousand stories. This methodology and art probably influences your writing style, possibly defines it. To see and absorb something for myself, I have to leave the camera at home. The screenplay is the blueprint for a visual medium. Yes, sound is just as important as well. The point here is that you essentially develop a clear focus in showing pictures filled with significant or relevant details that tell that story in terms of setting, characters, action, plot. When writing a novel you create the ‘movie’ directly in the reader’s mind. As a filmmaker, you have many constraints. The underlying principles and structure are the same, but in a screenplay you have to be succinct, genre-specific, and extremely focused as everything depends on time and money. This often means to strip away scenes you love. You have to compromise. It can be very painful. As a writer, you have much more time to develop your characters or reveal the details of your settings. You can even express internal thoughts. Once the real editing process starts, you may find yourself in a similar position, but certainly not as radical as you are not tied to those 90 to 120 minutes. Some say that screenplay writing hones your skills with dialogues. In a film, actors add their own personality and flair; dialogs are tweaked and adapted all the time. It becomes a co-creation. As we watch a movie, we deduct thoughts or emotions from a character’s action and/or reaction. Silence becomes a carrier for meaning and mood . . . In a novel, you have to bring your characters to life with and through your writing: the way they talk, what they say how and when or what they keep to themselves. I find it’s best to draw one’s inspiration from real life people – their voices, language, slang, expression, pitch. Anything that defines them as the character they are in your mind. They can be pretty loud and possessive while developing a life of their own! As a writer, you never know how big your family really is 😊. One of the wonderful things about the book is the passion you show in describing the human/animal bond. Can you talk a little about a special animal who was fundamental to your spiritual development? Life is filled with cosmic humour in the way it teaches us. When I was a little girl, and I was tiny, we had a huge aviary in our garden and many owls in the trees. Our neighbor, an elderly lady, had 20 giant tortoises, eating giant salads while turning in circles within the narrow confines of a giant fence, which really worried me. That wasn’t all. She also had 25 cats, who got over that fence and traumatized our birds. My dad hated cats with a vengeance, which blocked me over my early childhood years. On the other hand, I couldn’t stand seeing birds in a cage, but when I secretly helped one out now and then, it had no chance against flying cats and freaky owls. Nor had I against dad. He hated cats so much that I was convinced they were coming after me. . .
Weirdly enough, cats taught me all through my life, both in reality and on a spiritual level. This became very clear in my healing work following my studies of the way of the shaman as taught by the late scientist Dr. Michael Harner. As you may have noticed, I shared my first OBE in the introduction of my novel, following the death of one of those 25 cats. That early incident set me on a spiritual path where I had to learn to balance the animal energies of birds and cats, which is reflected in my book and that I’m very aware of as I answer your question. As of age 11, I was on horseback all the time, accompanied by a bunch of speedy cocker spaniels, obsessed with chasing birds across the strand; an alarm clock of a dackel, especially if he was up with me on the saddle, meaning on top of the world; and a German shepherd, the fiercest and most loyal animal protector I ever had. The way he was at my side in really scary situations – suddenly going over a high entrance gate, just by pure animal intuition, even when I was miles away – is beyond grasp. There are too many stories to tell. Anyone with pets has their own. Pets are our teachers and loyal friends. We are vibrational units. It’s a totally different situation with animals from the wild. You won’t escape your teachers, even if someone tried to block their energy from your soul! I believe this was a natural response to my animal spirit energy, which can be harnessed in many ways – just as the San when they painted an animal on a rock. Everyone has their own; it’s a matter of being aware of it. It’s hardly a few months ago, that I encountered a wild lynx right outside my studio here, clashing with my hooligan tomcat who wasn’t impressed! Having said that, it’s crucial to be well grounded at all times, but the spirit needs to be free. This is where the bird energy comes in. In my years as an artist, I painted a whole series on ‘Birds’. I painted a series on ‘Dogs’. I never painted cats. Perhaps . . . not yet? Close eyes. Think CAT. What do you feel? When I think cat, I feel a tremendous energy. Flexibility. Action. It’s Pete in motion, when he jumps over that high fence and speeds up the mountain to save his wife from the flames. Now close eyes and think BIRD. What comes to mind? When I think bird, I fly. I let go. I see my shadow gliding under me. I feel free. I am Piu Piu on that first glorious flight across the valley and the ocean . . . I am Piu Piu in the turbulence above the swamps . . . I feel her clearly on her way home. I hope my readers do the same. We all were born with wings, why don’t we remember to fly? Based on the quote of one of my favorite poets, the Sufi mystic Rumi, ‘Born with Wings’ not only tells the true story of the immortal life of Piu Piu, it also takes us on a magical journey – a meditation if you will – within ourselves. That’s the power of the bird spirit energy. One last note: I close my eyes when my tomcat gets those mice and other critters – but we have a deal: NO BIRD. Whenever I hear that heroic yowl, I cringe. I accept. But now and then he comes with a sweet meow announcing that he brings me – a gift! The last one was on Easter morning. A little sunbird. It still freaks me out, but I learned to respond with grace and love. He lets me take the tiny feathered being from his deadly jaws, unharmed. I prepare a mix of honey and water and feed it from my finger until the shock subsides and its eyes are shining again. Then I let it fly . . . The character of Pippa is deeply connected to nature. With her we explore ancestral themes and Pippa finds her purpose here. Yet, many of us have lost touch with this primal connection to the earth. Is Pippa’s journey calling us back home? We are living in disintegrated times with everyone searching what’s lost and needs to be regained ‘out there’. “More, more, more,” demands Charlot in the story. “This is a ruthless world and one must be ruthless to cope with it”. ’Would you be afraid, if there were nothing to fear?’ asks our heroine when warned that she could ‘…fall from the sky and die’. ‘The soul of man is immortal,’ was already taught – well over 2000 years ago – by the Greek philosopher Plato, founder of the prestigious Academy of Athens in ancient Greece. This was the first institution of higher learning in the world. Isn’t it time for us to apply? In what was called a ‘divine comedy’ by film historian and critic Dr. Inga Karetnikova, Piu Piu takes us through her own inferno, her purgatory and, ultimately, into paradise. The book contains wonderfully written scenes of altered states of consciousness and meditative states. Can you talk about your experience or practice that guided your writing? Born in Namibia, just a few miles away from the Spitzkoppe, I was fascinated by the San, the oldest tribe in southern Africa. They are widely known for their rock paintings, which was a way for the medicine man to honor the sacredness of the animal spirit and to harness its essence. I resonated with their love and respect for the earth and the animal kingdom right away. But what really fascinated me was their metaphoric storytelling and how they slipped away into an altered state of consciousness during their ritual, the ‘trance dance’. I knew that it was something I wanted to explore. Did the absence of fear in a young child ever surprise you? Well, it wasn’t my time to cut the silver cord. There was a reason for me to return. A wave laid me gently on the beach at the feet of my terrified mom. So, here I am. The gift of that NDE was my absolute certainty that there is a loving, eternal connection with what I call Consciousness on the ‘other side of the veil’. We all have access to it in dreams, meditation, prayer, the vibrational power of pure intent and during moments of pure ecstasy. We come from it . . . We evolve back towards it . . . Life after life after life . . .
My path was laid out for me . . .
Story telling – in words and/or pictures – became the defining factor of my professional life, interwoven with my continuous search to heal, free and lift the vibration of body, mind and soul. It led me to practices like Zen meditation, Kriya yoga, the way of the shaman, spiritual healing techniques, clinical hypnosis, past life regression . . . amongst other paths. There was one crucial incident, however, that really shifted my understanding. It happened during my academic training in Paris, when an old man suffering from excruciating pain and abandoned by his family, died in my arms, begging for spiritual help during his passing. When I saw the dreaded transformation unfold before my own eyes during that communion, my perception truly changed. No matter how peaceful or traumatic the situation, what other loved ones reflected during their final surrender was a sense of release, peace and completion. Recognizing the immortality of their spiritual dimension, they knew again who they were and, gracefully, ascended into Light. All this inspired me to write this story, not only but also for those who might need it most: the baby boomer generation, which faces its own mortality. I’m one myself; I know how it feels. Life’s fast pace and personal fears may have kept many from addressing the most important existential questions. As a result, fear – in its many hidden expressions – not only wreaks havoc with our health, our mental wellbeing and happiness, but can bring us even to the point of fearing the light. Let’s not allow that to happen! In her very last moments, Piu Piu turns around and changes the course. Has spirituality always been a part of your life, as with your character Pippa? Yes, absolutely! There’s so much wisdom in the world and never there has been a time to access it that easily. Certain books I read again and again, always learning something new. I am grateful for the wise teachers out there – both in the visible and the invisible world. Beyond that, I believe that the most intense learning takes place through life itself during highly challenging times. Times when you stand with your back to the wall and you learn who you are in the way you react. That’s why fire plays a significant role in my story. And if you read carefully, you also find the theme of the drought, which we’ve been experiencing over the past 3 years and, more drastically than ever, right now with 50 litres per person per day. Which we have to share with our pets and plants . . .
We are part of Nature and Nature is part of us. We are intrinsically connected. What affects one, affects the other – separation is an illusion. When Piu Piu descends into despair and confusion, a thick fog covers the valley, in which Pippa loses her way. Once she incorporates ‘that other part of myself’ she feels complete again and follows her inner light. Isn’t this a mirror of what’s happening in the world? I’m writing this on Friday, the 13th April 2018 – a memorable day . 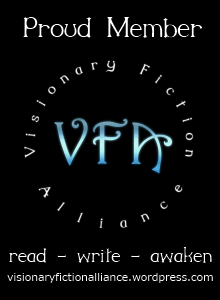 . .
What role do books like yours and other works of visionary fiction play in helping to shape the future? The emphasis here is also on ‘fiction’. Instead of expressing our thoughts or expert knowledge in a non-fiction book, we gently weave a message, a specific intent, into the tapestry of a visionary story, where readers can identify with characters on their magical journey into that un-remembered non-local domain or altered states of consciousness. We all were born with wings, but we forgot how to fly. Isn’t it time we try? So! Just as in real life, the magical journey continues! Our heroes will be back in a different constellation. They’ve already embarked on a new adventure filled with mystery and suspense. The tension between Anata and Charlot has been playing itself out over many lives. Will there be another tragedy or a happy ending? We’ll see . . . Expect to be surprised! THANK YOU for a magical moment in time that unites us, you, me, our readers and Piu Piu!